Just after the presidential election comes the choice for the legislative assembly. In 2002, after Chirac’s victory, his political party, UMP, won 356 seats (62%), while Le Pen’s (father) party (Front National) got nothing, not a single representative. In 2017, after Macron’s success, his totally new party, out of thin air, LREM, who did not even exist in previous elections, won 308 seats (53%) and Le Pen’s (daughter) party won 8 seats (1,3%). So in the first round of 2002, with 20% of voters in the presidential election, Chirac’s party obtained 62% of the parliament, while Le Pen, with 17% of the voters was not represented. The same outcome occurred in 2017. Macron with 24% of voters in the first round obtained 53% of the parliament, while Le Pen, with 21% had only 1.3% representatives for his party in parliament. 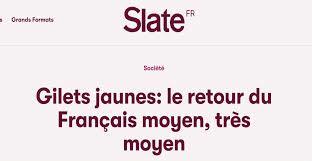 Basically, in France, one citizen in three has no political existence. These people are now in the street with a massive support of the rest of the population. 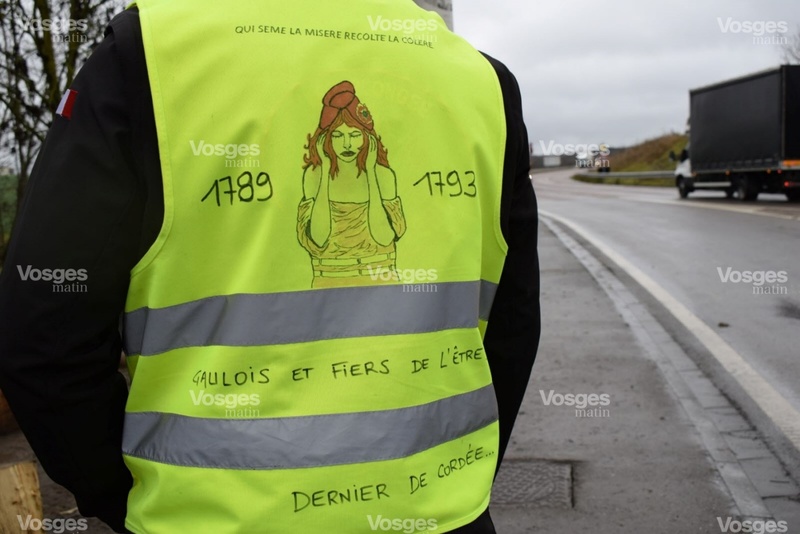 Why this brand “yellow vest” ? This vest is worn by working class people acting in a dangerous environment. The yellow color makes the person more visible, you can interpret this fact in a symbolic way, meaning politically visible. Two hundred years ago the yellow vests’ ancestors went as far as beheading their own king. Since then, France is well known for being a country of strikes and demonstrations, often unfruitful. But this one seems to be « the right one », the one that will bring effective changes. This movement seems to have reached a level of maturity lacking in previous events. Today, every age is affected, from students to retired people, every class, from unemployed to small businessmen. We can observe much more women participating too. The movement started, as usual, with financial claims but soon turned to political claims, demanding more political decision-making power to be given to the population through the use of extensive referendums. Another characteristic of this movement is that it is genuinely popular, not partisan, and refuses to have any political party officially join it, showing its full distrust in all the traditional political apparatus. It does not want leaders and just allows some “porte paroles” to speak in its name. 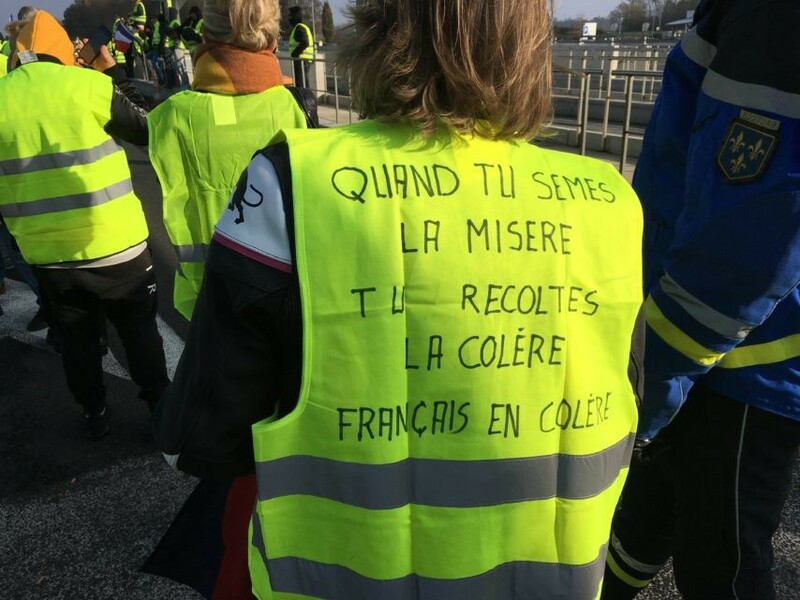 Therefore, every Saturday to allow the employed to participate, the French wear their yellow vest – the one they are obliged to keep in their car and use in case of breakdowns – and gather in city streets, on highways tolls, on countryside “ronds-points” [crossroads]. They are not only gathering in Paris, as mainstream medias would like to make their readers believe, but in every major city or town, all around France and particularly in remote parts of the country where the government is closing schools, hospitals and public services because they are unable to make profit on it, as if they were built on tax payer’s money to make short term profit and not to educate and tend to the population in the long term. 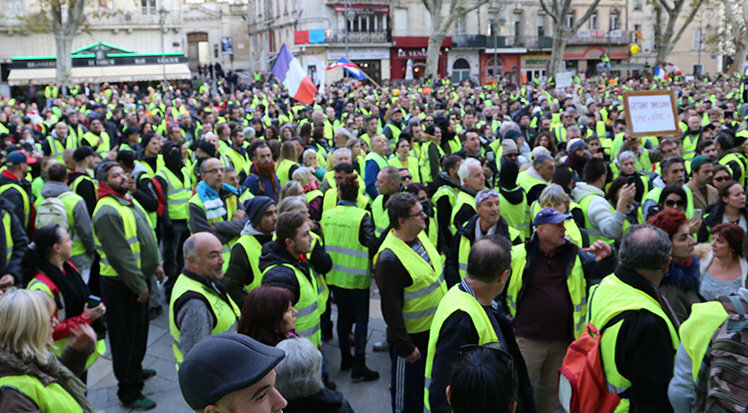 Although the French government, and the mainstream medias, have done all it takes to lessen the movement, we are now at « act 5 » of the movement, meaning the 5th Saturday of the Yellow vests’ protests and the momentum is still strong. The first Saturday the government did not expect such a wide protest, especially its spread throughout the country where the local media genuinely reported about it. The government mistakenly ignored the success of the protest thinking that it will, as the previous ones have, quickly fade. The 2nd act brought more people to the streets – numbers ran from 106.301 following the government’s so precise estimate to 500.000 – but then the police and the media were more prepared and made a show by blocking the protesters on the Champs Elysées, in front of the cameras, pushing them to the brink of violence, displaying on TV how the so called “pacific protesters” are in fact just a bunch of thugs acting for themselves and not for the sake of the nation. But, in their strategy, they forgot that smartphones can record the police mischiefs, making them viral on social media, as it showed that the violence came from the police and the government, and not from the protesters. After the 2nd act, 70% of the population continued to support the movement. For the 3rd and 4th acts, the government decided to change its strategy by trying to forbid the protesters to reach the gathering points. 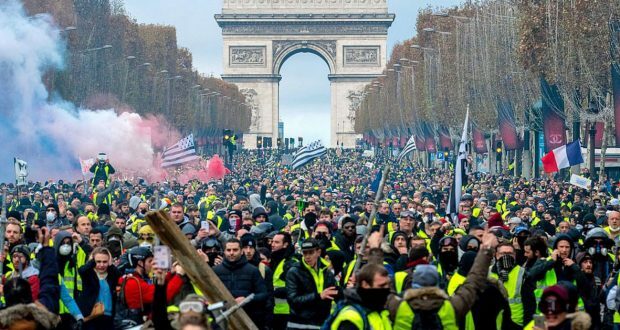 Over a thousand individuals arrested, multiple subway lines closed, protesters wanting to reach Paris forbidden to access the train or blocked on the roads, the protesters in the capital city split into small groups by the police and forbidden to reach their destination. The media took this opportunity to talk about a lack of dynamic in the movement, a decline in protestors due to the population starting to get tired about it. Then Macron gave a speech that could be compared to one of a drama student imitating compassion. He promises to raise the minimum wage by 100 euros. “This is for you, poor guys, poor single mothers, and now go back home”. Two days later, a “lone wolf terrorist” launched a mass shooting in the middle of a popular Christmas market killing 2 people and injuring several others. 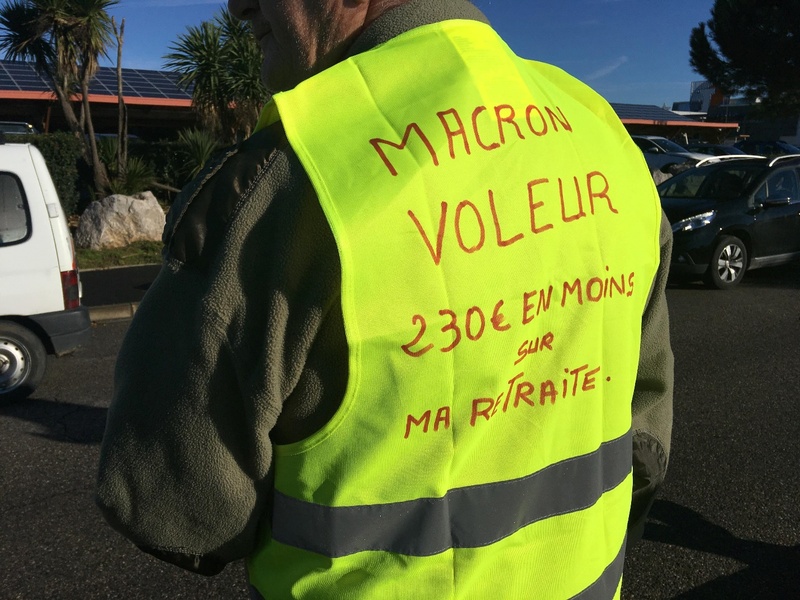 Immediately the media titled: “The yellow vests give great opportunities to terrorists”. Too bad for the movement’s popularity. For the 5th act, it seems like the things are steadying. The government is still doing its best to downsize the number of participants. Medias are doing their best to demonize it but still prefer to avoid speaking about the matter. Even the social media seem to have quiet down about the subject (algorithmic censorship?). There was less violence. The prime minister publicly recognized the governments mistakes and promised to hold a national discussion about the political aspects of the claims, especially the “Référendum d’Initiative Citoyenne” [Referendum hold on request of the citizens], the central political claim that could give power back to the citizens. Christmas and the New Year are nearing and we can expect a kind of pause, or at least a decline during that period, in order to spend the holidays among family. As soon as January starts, the government will have to show its seriousness about political talks. If it is not the case, you can expect a stronger yellow vests insurgency. 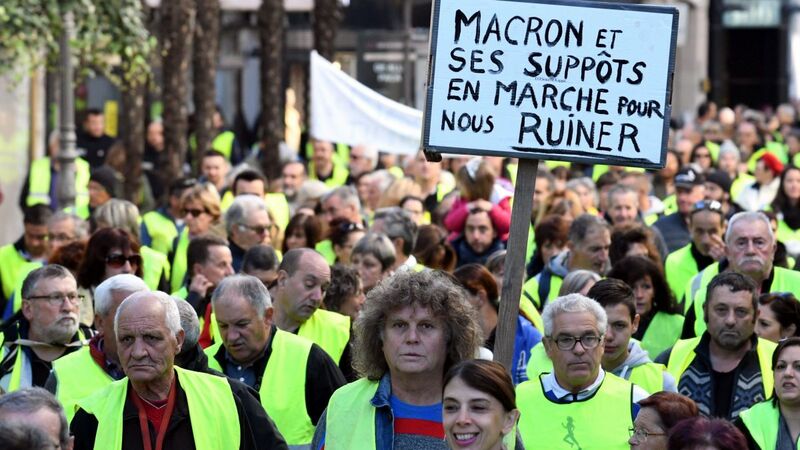 The government has understood that it cannot take the population for a fool anymore, a bad habit that was really visible with Macron’s attitude and even more with the way he managed the first three weeks of the movement. 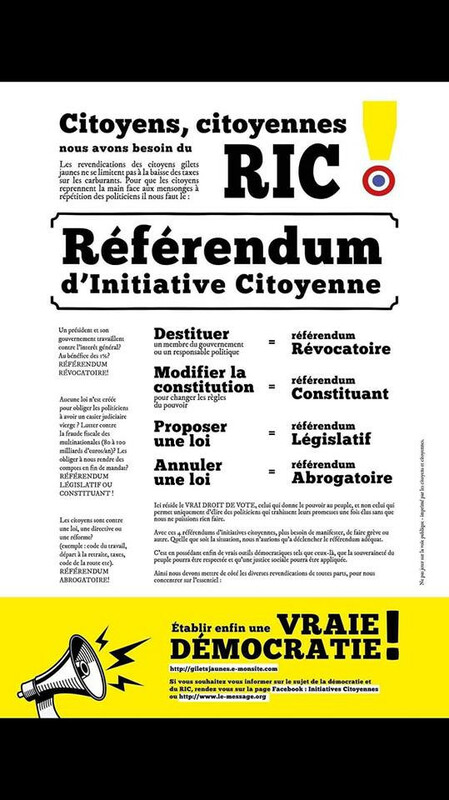 The RIC, the Référendum d’Initiative Citoyenne. That long promised but never voted system that could give back big shares of sovereignty to the population thanks to referendums that can dismiss unpopular government or ministers, cancel laws that are considered not good for the nation, or change details of the constitution. The ball is now in the government’s court. Let’s see how it will react in January. May 15, 201 7 “Information Clearing House” – The closest I ever got to Mosul, Iraq’s second largest city, was 1,720.7 miles away — or so the Internet assures me. Although I’ve had a lifelong interest in history, I know next to nothing about Mosul’s, nor do I have more than a glancing sense of what it looks like, or more accurately what it looked like when all its buildings, including those in its “Old City,” were still standing. It has — or at least in better times had — a population of at least 1.8 million, not one of whom have I ever met and significant numbers of whom are now either dead, wounded, uprooted, or in desperate straits. Though there’s been remarkably little writing about it, here’s what now seems obvious: when the fighting is finally over and the Islamic State defeated, the losses will be so much more widespread than that. Despite initial claims that the Iraqi military (and the U.S. Air Force) were taking great care to avoid as much destruction as possible in an urban landscape filled with civilians, the rules of engagement have since changed and it’s clear that, in the end, significant swathes of Iraq’s second largest city will be left in ruins. In this, it will resemble so many other cities and towns in Iraq and Syria, from Fallujah to Ramadi,Homs to Aleppo. When Mosul is officially retaken, if not “ahead of schedule,” then at least “according to plan,” the proud announcements of “victory” in the war against ISIS will make headlines. Soon after, however, Mosul will once again disappear from our American world and worries. Yet that will undoubtedly only be the beginning of the story in a world in crisis. Fourteen years have passed since the U.S. invaded Iraq and punched a hole in the oil heartlands of the Middle East. In the wake of that invasion, states have been crumbling or simply imploding and terror movements growing and spreading, while wars, ethnic slaughter, and all manner of atrocities have engulfed an ever-widening region. Millions of Iraqis, Syrians, Afghans, Yemenis, Libyans, and others have been uprooted, sent into exile, or fled across borders to become refugees. In Mosul alone, untold numbers of people whose fathers, mothers, grandparents, children, friends, and relatives were slaughtered in the Iraqi Army’s offensive or simply murdered by ISIS will be left homeless, often without possessions, jobs, or communities in the midst of once familiar places that have been transformed into rubble. To frame things slightly differently, let me ask another question entirely: In these last years, haven’t you wondered what ever happened to “globalization” and the endless media attention that was once paid to it? Not so very long ago we were being assured that this planet was binding itself into a remarkably tight knot of interconnectedness that was going to amaze us all. As Thomas Friedman of the New York Times put itin 1996, we were seeing “the integration of free markets, nation-states, and information technologies to a degree never before witnessed, in a way that is enabling individuals, corporations, and countries to reach around the world farther, faster, deeper, and cheaper than ever.” All of this was to be fed and led by the United States, the last superpower standing, and as a result, the global “playing field” would miraculously “be leveled” on a planet becoming a mosaic of Pizza Huts, iMacs, and Lexuses. Given the transformations of recent years, just think what it will mean to uproot ever vaster populations, to set the homeless, the desperate, the angry, the hurt, and the vengeful — millions of adults and childrenwhose lives have been devastated or destroyed — in motion. Imagine, for instance, what those pressures will mean when it comes to Europe and its future politics. On Sunday French voters went to the polls and chose Emmanuel Macron rather than Marine Le Pen to be France’s next president. Macron, a former investment banker and economics minister in the hugely unpopular government of President Francois Hollande, was endorsed by Barack Obama, Angela Merkel and the rest of the global elite who favor the unfettered reign of global capital. As economics minister, he succeeded in passing anti-labor legislation that caused rioting in French streets. He supports the privatization of social services like health care and education, NATO hostilities on Russia’s border, and President Donald Trump’s direct missile strikes on the Syrian government of Bashar al-Assad. Marine Le Pen called for France’s departure from both NATO and the European Union, restoration of the French franc as its currency, and “intelligent protectionism” to defend the living standards of French farmers and workers. She favors detente with Russia, she condemned Trump’s missile strikes on Syria, and she has pushed for restricting immigration and deporting citizens of other nations who are on France’s terrorist watch list. She was endorsed by prominent British Brexit campaigner Nigel Farage and praised by Donald Trump. Both Macron and Le Pen called for prison capacity expansion, but Macron was reported to have called for fewer new cells than Le Pen. American author and Counterpunch writer Diana Johnstone says that elites whipped up mass hysteria that Le Pen is a fascist to put the neoliberal globalist Macron in power. I spoke to Diana in Paris where she has lived most of her adult life. Ann Garrison: There’s so much furious determination to identify Marine Le Pen as a fascist that it’s difficult to have a rational conversation about it. Diana Johnstone: Tell me about it. I’ve stopped trying to talk about it to Americans because they’re just not interested, and the myth is so delightful that no one wants to give it up. Everybody likes to believe they’re fighting fascism. AG: Well, I can’t even tell what they mean by that. The word’s being used very vaguely and self-righteously. DJ: That means Hitler coming back to life and putting minorities in Auschwitz and then the gas chambers. AG: So they mean extremely racist and genocidal. DJ: Well, that’s the implication, but there’s no sign that she’s a racist and there’s no threat of institutionalized racism here. She is extremely hostile to Islamic fanaticism but Islamic fanaticism is not a race. AG: To be a real fascist, wouldn’t she have to want to shut down the media and suspend the French constitution? DJ: Well, you can list everything that characterizes fascism and nothing on the list applies. That’s one of them, but there’s nothing fascist about her. This is just propaganda that is being spread not only by the French establishment but also by the whole Western, NATO establishment. The real issue here is that there is a growing criticism of the European Union (EU) in France, and the whole Western establishment is panicked about this. Ever since the Brexit, they’ve been afraid that this pro-national sovereignty tendency in France, which manifests across the whole political spectrum, could gain momentum and that France might leave the EU and NATO. And of course the whole globalizing elite absolutely don’t want this to happen, so they went all out to invent their own special candidate, who is supported by everybody in the elite. Merkel, Obama, all of the billionaires, all of the banks, and all of the media, which of course is owned by the billionaires. They went all out to create panic that Marine Le Pen might win. This was just theatre calculated to elect a person who is responsible for the most unpopular economic policies of the Hollande government. Hollande was so unpopular that he couldn’t run for a second term. His approval rating in polls was down to single digits. So the whole elite and its press invented Macron to take his place. The press all started saying that Macron was going to be the next president as soon as he left the government and said he was going to create his new political movement. All of this is to reinforce the policies that were so unpopular in the outgoing Hollande government, but behind a new young face. This is a total charade, but Macron is even worse because when he was economics minister, he managed to get some very anti-labor legislation passed, then made it clear that he was leaving that government because he hadn’t been able to push it far enough. So he’s virtually promised to make things worse for working people, but nobody paid any attention to that because so many people were screaming, “Fascism! Fascism!” It was really grotesque. AG: Simply posting any questions about who Marine Le Pen is has been enough to trigger tirades on social media pages. DJ: I don’t know why these people are so enraged. Where do they get their information? How are they so sure of what they’re saying? What are their sources? What are they talking about? AG: What would Marine Le Pen have to do to qualify as a fascist, from your point of view? DJ: Well, she’d have to be in favor of a single party. She’d have to be resorting to violence and various other things, but the point is that her economic policies are actually very left wing. They are very close to those of the left leader, Jean Luc Mélenchon. DJ: Yes, I know. Have you ever heard of mass hysteria? DJ: Well, this is mass hysteria. All these people in the power elite will praise one another. It’s a great power club. Now they’re saying that Macron’s election saved us from fascism, and people are buying it, both inside and outside France. AG: I’ve seen the press comparing him to JFK, and you said that French people will see his face on magazines whenever they go to the hairdresser or the doctor. DJ: Yes, he’s been made by the press. As soon as he left the government and said that he was going to form this new movement, “En Marche,” all the magazines put his picture on the cover. The American “Foreign Policy” magazine ran an effulgent article right at the start about what a genius new leader he was and how certain he was to be the next French president. AG: Someone at a gathering of French farmers hit Macron in the head with an egg. DJ: Yes, it’s not hard to understand why and that may happen more. Of course, Marine Le Pen appealed to the farmers and workers who are really suffering in the European Common Market, but the human rights people decided some time ago that workers, farmers, and poor people who are complaining must be complaining because they’re racists. They don’t say they’re racists, they don’t act like racists, but they must be racists. That’s the human rights ideology, so the working class which used to be the favorite of the left is now its hobgoblin, and they’re saying, “Look at all these racist workers and farmers supporting Marine Le Pen.” In fact workers and farmers supported Le Pen because they’re losing jobs, they’re losing security, and their social services are going down the drain. Many of them supported Le Pen because she is going against the policies of the European Union and globalization. AG: Just to make it quite clear what we’re talking about here, Macron and the rest of the globalist elite are advancing an order in which global capital can freely chase the cheapest labor all over the world, including industrial farm labor, then come back with products with no tariffs imposed upon them, and even sue any government that becomes inconvenient for them. DJ: That’s about it. What Le Pen and others have said is that they want some “intelligent protectionism” and that goes against the whole neoliberal program, which is to make the whole world safe for investment capital. Certain countries will just be wiped out by this. 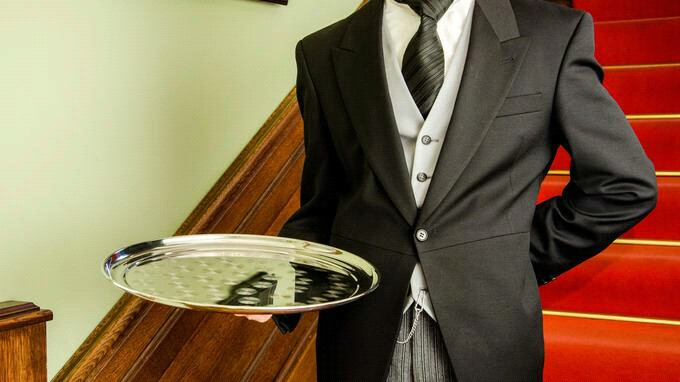 France has a tradition of pretty good social services. In fact they’ve been excellent, though they’re now getting worse because of the current government. The French are very attached to their social services, but if you privatize them all and then international financial capital says, “Hmm, we can make more profit in something other than transportation, health care or other services,” then they’ll just go and invest somewhere else. So, if you just have unfettered capital like that, you can’t necessarily preserve the existence of your country. Resisting globalization is just the most basic self preservation impulse; people want to preserve their countries as places where you can live decently. That is demonized as being nationalism and nationalism is demonized as fascism and racism. AG: When I spun off my little description of globalization, I should have included the privatization of everything. DJ: Yes, that’s right. And Europe is already the frontline of globalization. It’s been opened up as a playground for financial capital, and Macron was made by financiers. The financial elite found him to be a talent; they brought him into the Rothschild Bank and in no time, he’d made a few million dollars. Once someone finds out how fast they can make money like that, it’s like they’re being initiated into the club and they’re going to defend its interests in every possible way. Diana Johnstone is the author of “The Politics of Euromissiles: Europe’s Role in America’s World,” “Fools’ Crusade: Yugoslavia, Nato, and Western Delusions, and “Queen of Chaos: The Misadventures of Hillary Clinton.” Her essay “The Main Issue in the French Presidential Election: National Sovereignty and the Future of France,” appears on the Counterpunch and Global Research websites. Are the French elections a turning point? Winning the French presidency by Emmanuel Macron has been given a big international and regional importance to the extent of describing it with the big transformation in policies, many considerations were dedicated for this idea, as the recall of the partisan project of Macron which was born a year ago, it was linked with renewing the democracy, which France forms one of its bases. Some people have shown the decline of the traditional historical parties especially the Republican and the Socialist Parties which shared the political history of France for half of a century and more. The modernizing electoral platform of Macron at the economic or the political levels made some of the followers of Macron halt at it, it talked about new situation that based on combining the capitalism with the socialization economically, linking the French nationalism with the globalization politically, and the reliance on the youth and the social media in a new structure that is described as revolutionary at the level of the partisan work. At the first systematic verification of the campaign of Macron intellectually, politically, and economically, all the arguments are dropped. Macron emerged as a candidate, who meets the aspirations of banks and the major French companies on one hand, and the alliance which is represented by the Saudis and the Israelis in the regional policies on the other hand, a candidate who supersedes Francoise Hollande. After the attempts of tempting the Republican party to bring a new Jacques Chirac or a new Nicolas Sarkozy who can meet these policies have failed in front of the accumulative challenges that affect France and its political independence in the time of the US weakness, and the risks of displacement and the terrorism in the light of the war on Syria, the recession, and the unemployment in the light of the failure which affected the European project after the fall of the bets on weakening Russia as an indispensable source of gas, and the controlling of the resources of the Chinese energy by subjugating Iran. But the campaigns led by America and then by France to achieve these goals failed. The allies’ front has started to regress after the exit of Britain out of the EU, and the attempt of the un-globalized fund in America to take the role of the global policeman along with the adoption of the arrival of Donald Trump to the White House before he was trained and tamped by the globalization institutions in America. Macron represents the policy of denial which is practiced by those concerned about globalization after their defeat, so in order to ensure their winning they brought the appropriate opponent. An opponent that it is easy to be invested to make the French people in front of the two choices; the fear or Macron after the Republican Francois Fillon was alienated in an invented way, although the observers meet on ensuring his wining in presidency, but for the campaigns which were against him and led to his failure in reaching the second stage, if he was allowed to continue he would win presidency versus Macron or Le Pen, the ensuring of the winning of Macron was in accordance with restricting the competition between him and Le Pen, while the French would be responsible for the rest. Marine Le Pen’s project was foreshadowing the French people with the fear of the unknown within a discourse that threatens of civil war among the French people depending on the color of their skin, and their religion, moreover it grants the terrorism an incubating environment that contains five million Muslims who will be exposed to torture if Le Pen wins, in addition to another unknown that is represented by the impossibility of the exit of France from the EU without destroying it. Knowing that it is in the center of the Union, and it is no longer has its special currency as Britain. So it is logical that France chooses between the unknown and the continuation of the previous situation, not a preference for him but to prevent the reach to the unknown, so Macron wins with fewer voices than Chirac in 2002 versus his father. What will Macron do in confronting the French challenges; the economy and the war on terrorism in particular? France is burdened with burdens which Macron did not have responses for them despite the improving aspects promoted by the followers of Macron, as revitalizing the economy by reducing the taxes on the major companies as a recipe for the globalization, but it is an experienced failed recipe, because it will not encourage but only the money and the real estate companies and the barters, while the productive sector which needs for customs protection will continue regressing and the labor sectors will supply the unemployment with new figures, here is the importance of Fillon’s proposal of reformulating the EU according to the variables of the national economy and its protection, while in confronting the terrorism. Macron’s project is to continue following Hollande’s recipes which based on turning France to a follower of the US policies, and following Saudi Arabia and Israel and the cooperation with the Wahhabism and the Muslim Brotherhood. These two teams were vowed by Fillon to ban their presence in France in case of his winning. The legislative elections will take place along with a parliament that will make it difficult for the president to form a government that is similar to him whatever there will be fierce promoting media campaigns and whatever how much money and media will be spent. The parties which obtained in the first round a closer proportion of twenty percent are three; the radical left led by Jean-Luc Mélenchon and the extremist right led by Marine Le Pen and the Republican party with its new leadership after the stepping down of Fillon will share the 60% which they won in this session, while Macron will share with his allies in the Socialist party and some of the small parities the remaining 40%. The trade unions which received Macron with the general strike are continuing, they know Macron very well and he knows who support them, the danger of terrorism is remaining and the developments in Syria are resolved no matter if the French presidency changed, although Hollande himself who is Macron’s reference was unable to change them, which means that the first year of Macron will disclose him gradually in front of the French people to reach to the proportion of 7% which Hollande reached after years. Macron is repetitive copies of Hollande but with industrial coat that soon will be removed and the forged goods will be revealed. – أُعطي فوز إيمانويل ماكرون بالرئاسة الفرنسية حجماً دولياً وإقليمياً كبيراً لدرجة وصفه بالتحوّل الكبير في السياسات، وحُشدت لصالح هذه الفكرة اعتبارات من نوع التذكير بمشروع ماكرون الحزبي الذي ولد قبل عام ورُبط به تجديد الديمقراطية التي تشكّل فرنسا واحدة من قلاعها، كما استعرض آخرون تراجع وضع الأحزاب التقليدية التاريخية، خصوصاً الحزبين الجمهوري والاشتراكي، اللذين تقاسما تاريخ فرنسا السياسي لنصف قرن وأكثر، ووصل بعض الماكرونيين للتوقف أمام ما وصفه بالبرنامج التحديثي لماكرون سواء على الصعيد الاقتصادي أو الصعيد السياسي، متحدّثاً عن وسط جديد يستند إلى جمع الرأسمالية بالاشتراكية اقتصادياً، وجمع الوطنية الفرنسية بالعولمة سياسياً، والارتكاز على الشباب ووسائل التواصل في هيكلية جديدة وصفت بالثورية على مستوى العمل الحزبي. – لدى أول تدقيق منهجي بالحملة الماكرونية فكرياً وسياسياً واقتصادياً تسقط كلّ الحجج المساقة، وينكشف ماكرون عن بدل عن ضائع لمرشح يلبّي تطلعات المصارف وكبريات الشركات الفرنسية من جهة، والحلف الذي يمثله السعوديون و«الإسرائيليون» في السياسات الإقليمية، يخلف فرنسوا هولاند، بعدما فشلت محاولات ترويض الحزب الجمهوري للمجيء بجاك شيراك جديد أو نيكولا ساركوزي جديد، يلبّي هذه السياسات، أمام تحدّيات متفاقمة تطال فرنسا واستقلالها السياسي في زمن الضعف الأميركي، ومخاطر النزوح والإرهاب في ضوء الحرب على سورية، والكساد والبطالة في ضوء الفشل الذي أصاب المشروع الأوروبي بعد سقوط الرهانات على إضعاف روسيا وترويضها كمورّد للغاز لا بديل عنه، والتحكم بموارد الطاقة الصينية عبر إخضاع إيران، وقد باءت الحملات التي قادتها أميركا والتحقت بها فرنسا لبلوغ هذه الأهداف بالفشل. وبدأ تداعي جبهة الحلفاء بخروج بريطانيا من الاتحاد الأوروبي، ومحاولة الرأسمال غير المعولم في أميركا الانتفاض على دور الشرطي العالمي مع تبنّي وصول دونالد ترامب إلى البيت الأبيض قبل أن تطوّعه وتروّضه مؤسسات العولمة في أميركا. – ماكرون ممثل سياسة الإنكار التي يمارسها المعولمون بعد هزيمتهم، لذلك كي يضمنوا نصرهم استجلبوا الخصم المناسب إلى الحلبة، خصم يسهل وضع الفرنسيين أمامه بين خياري الذعر أو ماكرون، بعدما أبعد بطرق مفتعلة الجمهوري فرنسوا فيون الذي يُجمع المراقبون على ضمان فوزه بالرئاسة لولا الحملات التي استهدفته، وأدت إلى عدم بلوغه المرحلة الثانية ولو وصل بوجه ماكرون أو لوبان لضمن الرئاسة. وكان ضمان فوز ماركون وفقاً على حصر المنافسة بينه وبين لوبان، ويتكفل الفرنسيون بالباقي. فمشروع مارين لوبان كان يبشر الفرنسيين بالخوف من مجهول مع خطاب يهدّد بحرب أهلية بين الفرنسيين على لون بشرتهم ودينهم ويمنح الإرهاب بيئة حاضنة قوامها خمسة ملايين مسلم سيتعرّضون للتنكيل مع وصول لوبان. هذا عدا عن مجهول آخر يتمثل في استحالة خروج فرنسا من الاتحاد الأوروبي من دون هدمه، وهي في قلب الاتحاد وليست على طرفه، ولم يعُد لديها عملة خاصة كحال بريطانيا، ومنطقي أن تختار فرنسا بين المجهول واستمرار الحال السابق بقاء القديم على قدمه فيصل ماكرون بأصوات أقلّ من التي جاء بها شيراك عام 2002 بوجه والد لوبان، ليس تفضيلاً له بل منعاً لوصول الخوف من المجهول. – ماذا سيستطيع ماكرون أن يفعل في مواجهة التحديات الفرنسية. فعلى صعيد التحديين الأهمّ الاقتصاد والحرب على الإرهاب، تنوء فرنسا تحت أعباء لا يملك ماكرون لها أجوبة رغم الفذلكات التجميلية التي يسوقها المروّجون للماكرونية، تنشيط الاقتصاد بتخفيض الضرائب على الشركات الكبرى هي وصفة العولمة، وهي وصفة مجربة وفاشلة. فهي لن تشجع إلا شركات المال والعقارات، والمضاربات، بينما القطاع الإنتاجي الذي يحتاج لحماية جمركية فسيستمرّ بالتراجع وقطاعات العمال سترفد البطالة بأرقام جديدة. وهنا تكمن أهمية طرح فيون بإعادة صياغة الاتحاد الأوروبي وفقاً لمتغيّرات الاقتصادات الوطنية وحمايتها، أما في مواجهة الإرهاب فمشروع ماكرون مواصلة السير في وصفات هولاند القائمة على تحويل فرنسا ذيلاً للسياسات الأميركية والسير وراء السعودية و«إسرائيل»، والتعاون مع الوهابية والإخوان المسلمين، وهما الفريقان اللذان تعهّد فيون بحظرهما في فرنسا في حال فوزه. – ستأتي الانتخابات التشريعية وتحمل برلماناً يصعب على الرئيس تشكيل حكومة تشبهه مهما خيضت حملات إعلامية تسويقية ضارية، ومهما أنفق من مال واستهلك من إعلام. فالأحزاب التي نالت في الدورة الأولى نسباً متقاربة بحدود العشرين في المئة، وهي ثلاثة، اليسار الراديكالي بزعامة جان لوك ميلنشون، واليمين المتطرف بزعامة مارين لوبان، والحزب الجمهوري بزعامته الجديدة بعد تنحّي فيون، سيتقاسمون الـ60 التي حصدوها في هذه الدورة. وسيتقاسم ماكرون مع حلفائه في الحزب الاشتراكي وبعض الأحزاب الصغيرة الـ 40 الباقية، ونقابات العمال التي استقبلت ماكرون بالإضراب العام باقية على طريقها تعرف ماكرون جيداً ويعرفها هو ومن ورائه حيتان المال، وخطر الإرهاب باقٍ، والتطوّرات في سوريا محسومة الاتجاه لا يغير فيها تغيير الرئاسة الفرنسية التي كان أستاذ ماكرون هولاند نفسه عاجزاً عن تغييرها، ما يعني أن سنة ماكرون الأولى ستتكفل بتعريته تدريجياً أمام الفرنسيين لينال نسبة الـ7 التي وصلها هولاند بعد سنوات. – ماكرون نسخة مكرّرة عن هولاند مع ماكياج بطلاء صناعي سرعان ما يزول وتنكشف البضاعة المزوّرة.